BoE vs. ECB – Which will be the Biggest Surprise? Thursday is a big day for euro and sterling. There are 2 monetary policy announcements on the calendar and the U.S. consumer price report. This means that not only will we learn how eager central banks in Europe are to tighten monetary policy but we’ll also see how much pressure there is for the Federal Reserve to continue raising interest rates. The U.S. dollar traded lower against all of the major currencies today after an unexpected decline in producer prices. PPI fell for the first time in 18 months as oil prices stabilized and the dollar strengthened. CPI could be vulnerable to the same forces, especially as gas prices held steady last month. With that in mind according to the Beige Book, a few Fed district reported an increase in inflation pressures. However the dollar did not respond well to the Fed’s report because even though they said prices are rising in some areas and the economy expanded at a moderate pace, most districts noted concern and uncertainty over trade. They also did not see significant wage growth despite the tightness of labor market. There’s no question that the Fed will raise rates later this month especially with input costs rising but if CPI falls short of expectations, it will give investors another excuse to sell dollars. Although USD/JPY is consolidating between 110.50 and 111.80, the greenback could retreat more significantly against other currencies. How the USD trades vs. EUR and GBP will depend in large part on the tone of the European Central Bank and Bank of England monetary policy announcements. Both central banks are expected to leave interest rates unchanged so their guidance is key. 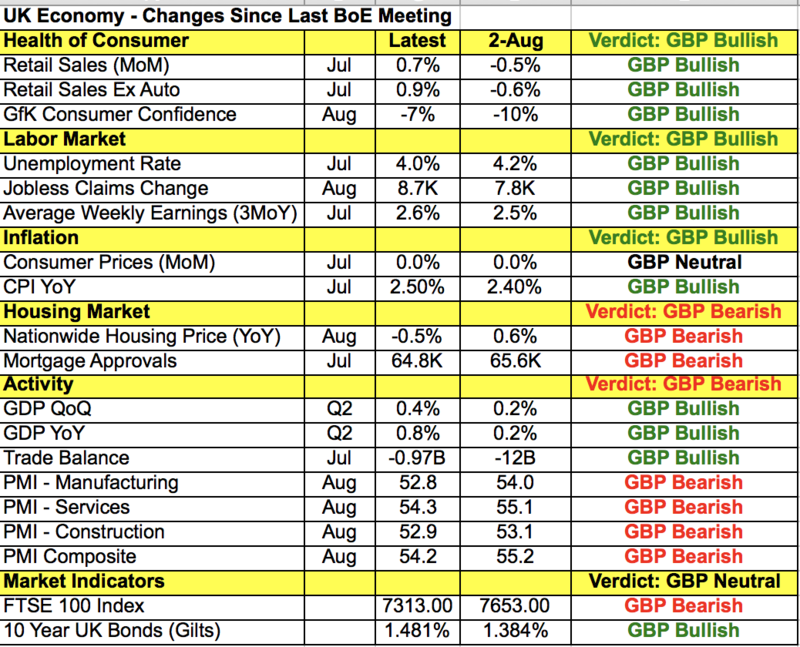 We’ll start with the BoE since their rate decision precedes the ECB. First, its important to know that there will be no press conference by Governor Carney but the MPC minutes will be released alongside the rate decision. Sterling is trading strongly ahead of the monetary policy announcement on the growing possibility of a Brexit deal and if the tone of the BoE statement is positive, we could see GBP/USD squeeze up to 1.3175. According to the table below, we’ve seen improvements in retail sales, trade, inflation and wage growth but manufacturing, service and construction sector activity slowed last month. The market is not pricing in another rate hike from the BoE until the middle of next year. Sterling traders however won’t be as patient as the central bank as any talk of more tightening this year o next could scare away of the shorts. The euro also benefitted from Brexit optimism but there’s talk the ECB could lower their growth forecasts on the heels of softer data. 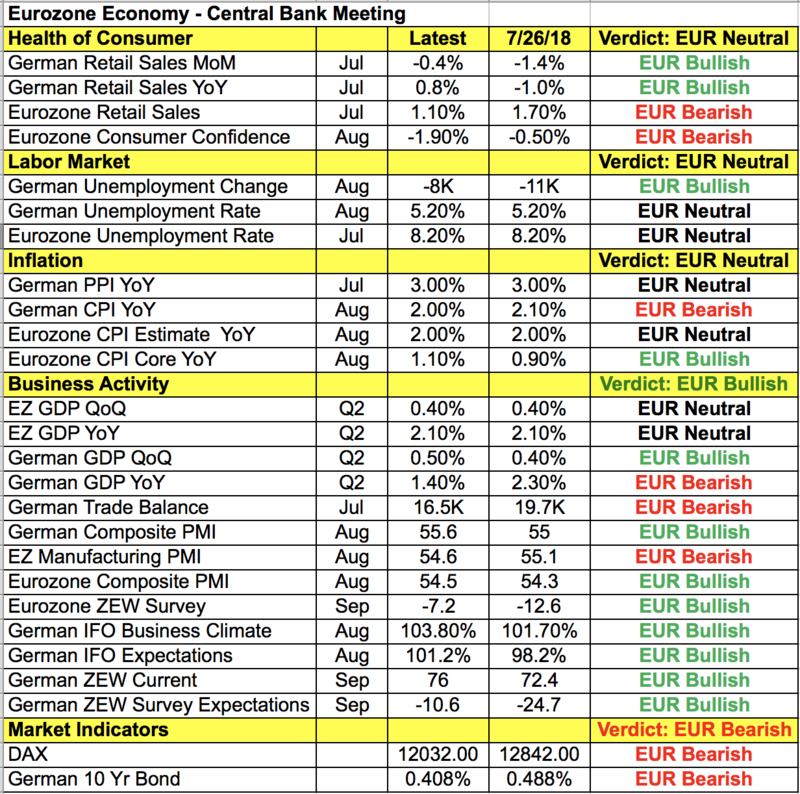 These expectations are reinforced by the latest Eurozone industrial production report, which showed activity dropping 0.8% in the month of July. 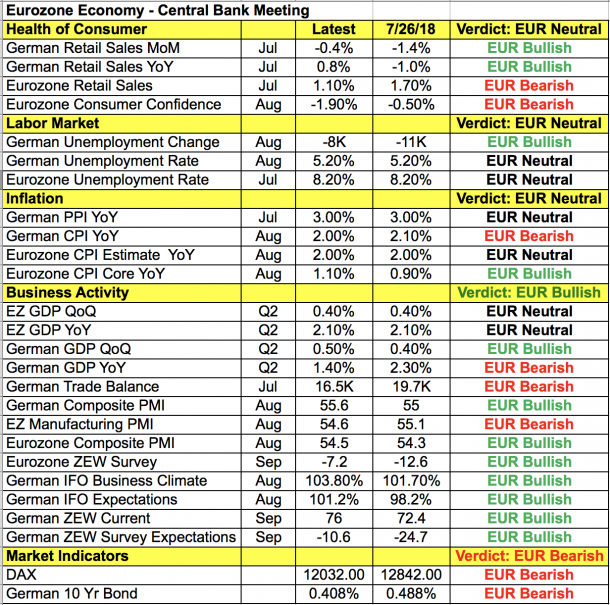 The ECB has taken every opportunity to talk down the currency and with trade tensions rising they should share the same concerns as Fed districts. The central bank made it clear at recent meetings that they have no plans to raise interest rates until late next year and their outlook isn’t likely to change since recent data has been mixed. When they last met, ECB President Draghi expressed concerns about low inflation and given the lack of a significant increase in price pressures, he’s likely to hold onto the view that it is too early to call victory on inflation. Super Mario’s press conference should be more market moving than the rate decision as he will be peppered with questions about Italy, trade tensions and the outlook for the Eurozone. Meanwhile, all 3 of the commodity currencies performed strongly today. Despite weaker consumer confidence, the Australian dollar led the gains on reports that the Trump Administration sent an invitation to China to begin a new round of trade talks. Investors are hopeful that these talks will yield results but until the U.S. officially agrees to dropping tariffs we are skeptical as we’ve seen how these talks can break down days after they begin. Just take a look at Canada. Earlier this week, Canada and the U.S. said major progress is being made but according to Trump’s top economic adviser Larry Kudlow, milk, which has long been the problem is still the biggest issue in negotiations. A deal could still be reached but until one is made, traders should tread cautiously. Nonetheless, AUD, NZD and CAD have been deeply oversold and the mere possibility of a positive turn in U.S.-China trade relations was enough to squeeze these currencies higher.